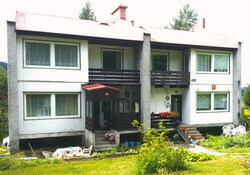 Accommodation is located in Harrachov in Giant Mountains, about 450 meters from the ski slopes. Within a range of 500 - 800 meters, there are several ski or bicycle rentals or ski schools. About 500 meters is a swimming pool (used in summer). There is a car park for free nearby the accommodation. Two double rooms are in the right part of the semi-detached house on the first floor. Each room has a flat-screen satellite TV and a private shower room with a toilet outside the room. Each room can have 2 extra beds. Rooms have free Wi-Fi in all areas. Both rooms share a fully equipped small kitchen. The apartment is in the second (left) part of the semi-detached house on the 1st floor. It is an apartment with a bedroom, a living room, a fully equipped kitchen, a toilet and a bathroom. There are 2 double beds in the bedroom. In the living room, you can get up to 3 extra beds by spreading the couch and armchair. 2nd apartment is in the left part of semi-detached house no. 409 on the ground floor. Rent a separate furnished apartment with a bedroom, a living room, equipped kitchen, WC with shower. The bedroom has one double bed and one single bed. In the living room there is a double bed and the seat can be divided into 2 extra beds. Two extra beds are available in the basement room, which has its own bathroom with toilet. Total 5 beds with up to 4 extra beds. This apartment will be available from 1.7.2018. The living room has a TV with Czech programs. Free Wi-Fi is available. The order is maintained by the guests themselves, the cleaning is done after the guests leave. Arrival is recommended between 14:00 and 18:00. Departure due to cleaning and preparation for other guests is required until 10:00. You can do many activities in the surrounding, including skiing and cycling. U Konvalinků Accommodation is situated 450 m from the funicular in direction to Čertova hora and 1 km from the Museum of Glass. You can also take advantage of our Taxi service and it is possible to arrange transport to Pardubice Airport which is situated 130 km from Harrachov, or from Prague Airport which is situated 160 km away from Harrachov. The CZK 15 municipal fee is already included in the price of accommodation.